This week’s Friday Fibers Roundup features a mix of soon to be open exhibitions as well as articles focusing on the inclusion of humor and the abject into art. 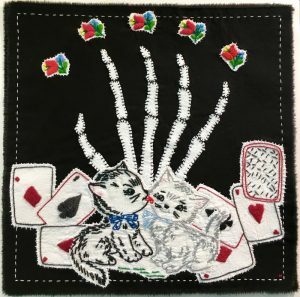 Maggy Rozycki Hiltner Love Gambled and Lost 2017, hand-stitched cotton and linen, found embroidery, 12” x 12”. 1) Symmetry Breaking presents eight artists from the Pacific Northwest: Emily Counts, Jovencio de la Paz, Jo Hamilton, Anya Kivarkis, Brenda Mallory, Kristen Miller, Emily Nachison and Jane Schiffhauer. The show is on display at The Art Gym in Portland, OR from October 1st to December 10th, 2017. 2) Artist Joe Bochynski created a fictional Department of Archaeology for New York City to contemplate what New Yorkers will leave behind today for future explorers to find (via Hyperallergic). 3) Roberto Benavidez creates fantastical piñatas inspired by Hieronymus Bosch characters which address themes of race, sexuality, art, sin, humor, and beauty (via Dangerous Minds). 4) Belarusian artist Lesha Limonov makes hilarious sleep masks from the eyes of famous paintings (via Creators). 5) “Goodbye to All That: Why Do Artists Reject the Art World?” by Giovanni Garcia-Fenech looks at Martin Herbert’s latest book–a collection of essays about 10 artists who play with the system, struggle against it, or walk away altogether (via Hyperallergic). 6) This video shows Adam Savage visiting the Hollywood Costume Exhibition discussing the role of the costume design in cinematic storytelling and the wonderful stories behind some of the 150 costumes on display. 7) Tangled: Fiber Art Now! 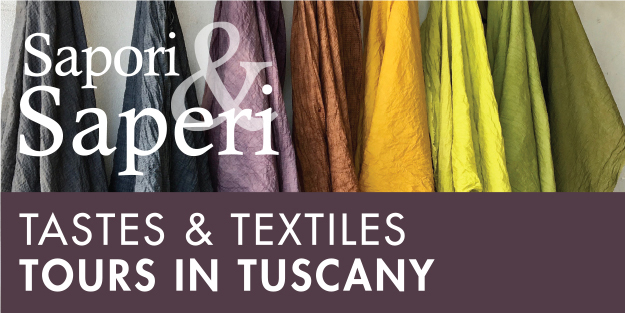 features artists who redefine how we perceive fiber arts using sculptures, installations and performance works to highlight connections to nature, the richness and diversity of culture, and the body and environment. Artist included are: Meg Arsenovic, Alice Beasley, Rena Detrixhe, Angela Ellsworth, Jimmy McBride, Caitlin McCormack, Mark Newport, Kristin Skees, Ben Venom, Megan Whitmarsh, and Xawery Wolski. The show is on display at the Taubman Museum of Art in Roanoke, Virginia through February 11th, 2018. 8) The short animation Pinky Toe, directed and composed mostly by Mathieu Libman, follows cartoons trying to find a missing toe and its insatiable itch (via Creators). 9) Doreen Garner’s exhibition Doctor’s Hours features an wonderful mixed media installation inspired by mix of tattoo shops and school of history (via Humor and the Abject). 10) “How Eva Hesse Embraced Absurdity in Life and Art” by Benjamin Sutton features an exclusive clip from the documentary “Eva Hesse” which features Lucy Lippard, Nancy Holt, and others reflecting on the intimate character of Hesse’s sculptures (via Hyperallergic).